Maps make great art for any room, whether it’s a framed vintage ordnance survey map or something more original, like the four artists Home Arty Home is featuring here. Regions are ripe for being represented by items specific to each area so we’re focusing on maps that use original elements to render each artwork uniquely. 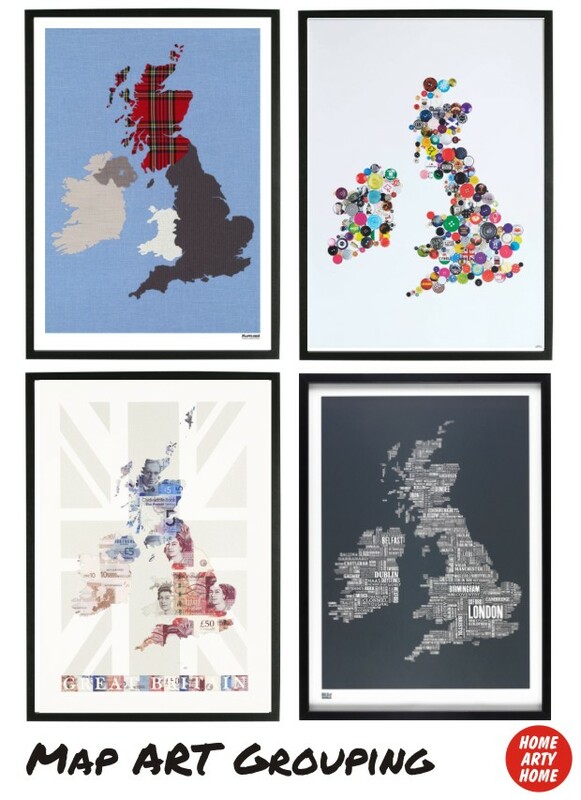 As Home Arty Home are based in the UK, we’re going to highlight maps of the British Isles from each artist. 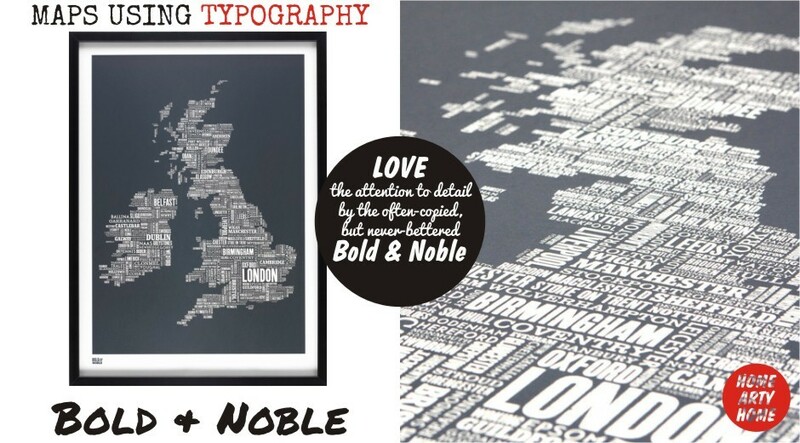 Firstly, Bold & Noble, who adeptly use various fonts to represent the British Isles with typography. There are many (often poor) copies of Bold & Noble’s distinctive style, but none come close to the expert graphic way in which they balance place names and fonts to create their maps. What could be a cold, graphic print in the wrong hands, Bold & Noble’s work is warmed through and made “homely” by screenprinting the artworks by hand. Each piece comes unframed direct from Bold & Noble’s website or Etsy store, and ready-framed prints of select items are available from John Lewis, online and in-store. Unframed prints range from £43 up to £120 for limited editions. Next up is Justine Smith, a fine artist who has been creating original artworks using currency. 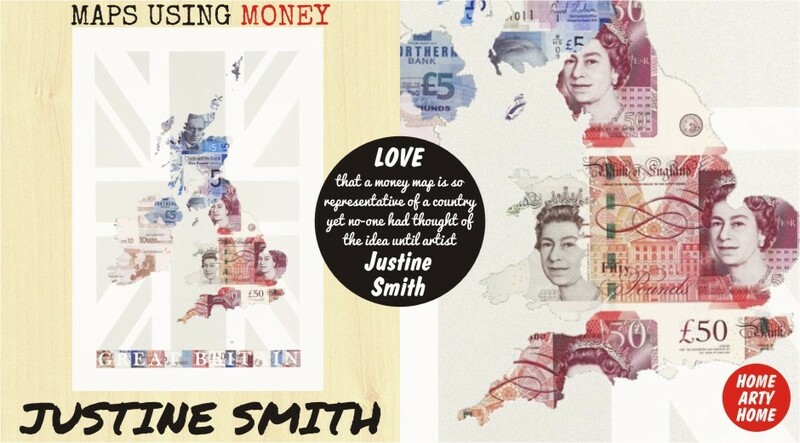 It seems so obvious that each country should be represented by money yet, before Justine Smith, no-one had thought of it. Justine uses banknotes to create her pieces and her work has been featured in prestigious galleries and exhibitions around the world. Limited-edition reproduction prints of the original artworks are available at TAG Fine Arts. The Great Britain print is available unframed for £295. 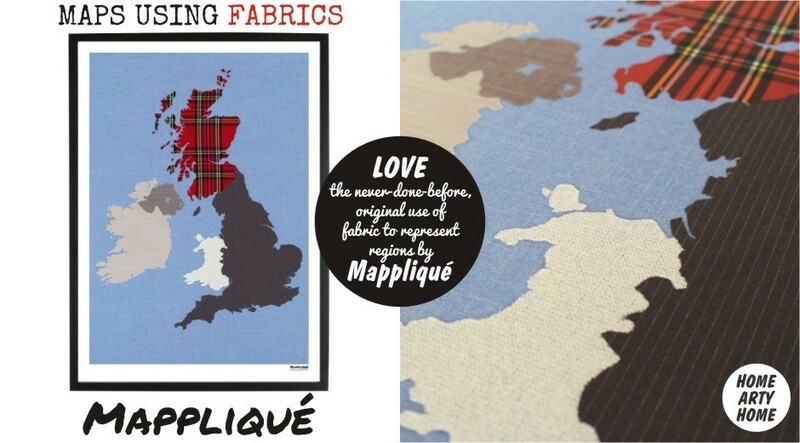 An original idea that we’re surprised no-one had thought of before, Mappliqué use textiles specific to each area to create their handcrafted maps. Like Justine Smith’s money, fabric seems an obvious “material” to represent each area but, before Mappliqué, no-one had thought to use textiles. Their map of the British Isles uses pinstripe to represent England, knitted wool for Wales, linen for Ireland, and, naturally, tartan to represent Scotland. The handcrafted fabric maps are also available as affordable reproduction giclée prints from their website, Etsy, or Folksy. 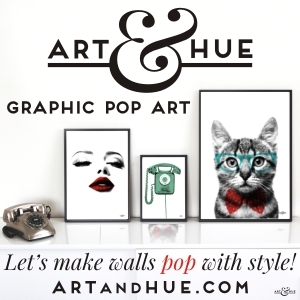 Handmade fabric art ranges from £69 to £400, with reproduction giclée prints from £12 to £129. 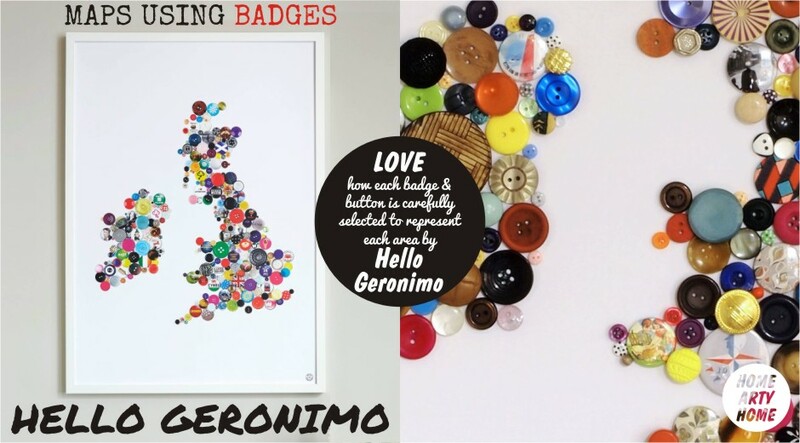 Finally, we take a look at Hello Geronimo, who use buttons and badges to create unique maps. Each button or badge is carefully selected to represent the area they’re used on the map (for example, a Fab Four Beatles badge for Liverpool, or a curry badge for Birmingham). Each 3-dimensional work is unique as they’re constantly evolving (they’re created to order with bespoke elements) and are available ready-framed starting at £270. Prints are available from £39. We love each unique map and any of them would look great in any home, in any room. They would also all look great together on one wall, as a grouped art display, united by identical frames. Any other artists using specific elements to create unique map art we should know about? Let us know via a comment below.